"Tunable" liquid lens glasses created by a British physics professor may provide inexpensive spectacles to a billion people. Joshua Silver's liquid lens spectacles are designed to be inexpensive to manufacture and child's play to use. The lenses can be fitted to the user without a visit to an optometrist. A small syringe attached to each arm of the glasses is used to adjust the amount of fluid present between the tough plastic lenses. Increasing the amount of fluid will provide more magnification; less fluid means a smaller degree of correction. Thousands of pairs have already been distributed. 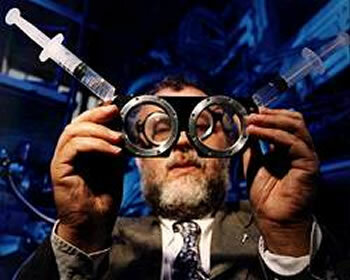 Professor Silver is now working on delivering one million pairs of tunable liquid lens glasses to poor people in India. Paul lay ... in a slit of rock high on the shield wall rim, eye fixed to the collector of a Fremen telescope. The oil lens was focused on a starship lighter exposed by dawn in the basin below them. From Inventor designs 'tunable' glasses to help one billion in Third World see.